The day-old chicks arrived at the store in a box delivered by U.S. mail. While I had ordered only half-a-dozen specialty breed pullets, they came boxed with two dozen unsexed White Leghorns for cushioning and warmth. 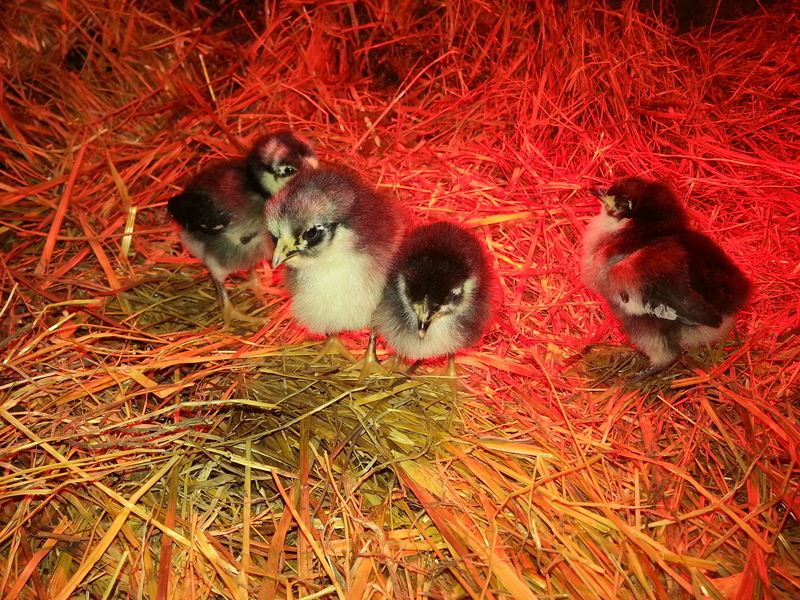 I had hung a heat lamp—a warm if impersonal surrogate for their mothers’ downy breasts—in a makeshift pen because the chicks were too tiny and frail to generate enough of their own body heat against the chilly Spring nights. The hanging lamp radiated light and heat downward to make a spot of warmth in the straw where the chicks gathered close to rest. I don’t think they ever fully slept, for the light. But they were warm and safe and comfortable. The children were thrilled with the new chicks. Each child cupped a fluffy golden chick in their hands, bringing it up close, looking into infant chick eyes, rubbing the fuzzy little creatures softly against their cheeks. It was like holding life itself: sweet and simple, full of love and innocence. It was like the earth, the sky, and the trees, like the aromatic Spring breeze, and like the rain that turns the alfalfa a deep green. The chicks were three weeks old and slightly larger and fluffier when the lamp bulb cracked and the element burned itself out on a rainy night in May. Bringing water the next morning, I found the pen dark and the chicks huddled in a corner of their pen. With instinctual faith, they had waited out the dark and the chill, not knowing that the sun always rises. Despite the cold, they were just old enough to have slept soundly, wrapped in their collective warmth. That evening, I screwed a new bulb into their artificial sun, just to be safe. The chicks were growing bigger, and I was worrying more and more about them in their temporary pen in my garage. I knew nothing about building chicken coops. Driving home from work I noticed a “Free Firewood” sign at a snowmobile and ATV store, and wondered at the seeming incongruity. Pulling my truck in to explore, I learned that the free firewood consisted of snowmobile and ATV pallets, some as long as ten feet, and all made of hardwood. I suddenly had the idea to build a chicken coop, at almost no cost, out of the free pallets. Several pick-up loads brought enough pallets. I scooped out a level spot by the garden, then dragged over the pallets and started banging them together to make walls. 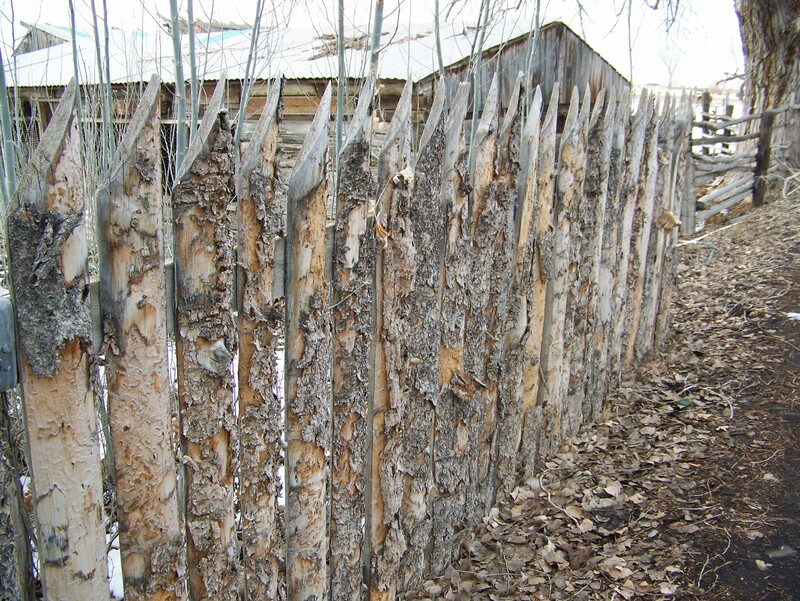 The pallet wood was so hard, often oak or poplar, that the iron nails bent prematurely more often than they fully penetrated. Before long I had turned three pallets into the front wall: twelve feet long by ten feet tall. I steadied it with two-by-four props, warning the children to stay away, then put a side wall together and attached it to the front wall. The side wall tapered from ten feet tall in the front to six feet tall in the back, and was eight feet deep. Harvey came over to help me finish the walls and frame the door, which swung on some old barn door hinges. For the roof we slapped on an assortment of old planks (two-by-sixes, -eights, -tens, and -twelves). Plywood scraps covered the walls and roof. Two thrift store windows allowed in light and warmth even in winter. The children excitedly set the chicks free in the completed coop. The chicks peeped gleefully and pecked around as if they thought they were real grown up chickens. I admit to stepping back as the sun began to set and standing melodramatically with my hands on my hips, smiling with pride at my meager accomplishment. In truth, the coop looked like a jigsaw puzzle with pieces from several old puzzles forced awkwardly together. But it worked. The walls stood up; the roof stayed on; the door opened and closed. The chicks seemed happy with their new home. What more should a coop be? Building onto the coop a few years later, Caleb (4), who wanted to be a part of the project, squatted on the low, descending, back part of the roof, six feet above the ground, near where I was working. A moment later I watched him, as if in slow motion, as he somersaulted off the roof, turning a perfect front flip and landing unharmed in the soft earth to squat on his feet and bottom. How grateful I was that he landed unharmed. Thereafter, he watched me from the ground. Brian (9) had the job of feeding and watering the chicks, which grew quickly into hens. Now I had a new problem: I hadn’t built any nesting boxes, and we didn’t want the chickens to lay their eggs on the ground where they would sit in the dirt and manure and get stepped on. So we assembled a bank of eight nesting boxes out of scrap plywood, this time following instructions in a book: the nesting boxes looked like they were meant to be nesting boxes. Attaching the row of boxes to the back wall of the coop, we filled each box with dry weeds because we didn’t yet have any straw. The chickens cautiously jumped up to the top of the boxes, but didn’t go inside. It took months for them to start laying, but the children checked every day anyway because each of them wanted to be the first to discover the first eggs. Erin (6) stared one day at a hen sitting in one of the nesting boxes. The hen was moving around and clucking in a funny way. She saw an egg squeeze out and plop onto the weed bedding, and screamed to the world, “A chicken laid an egg! A chicken laid an egg!” She ran into the coop to grab the egg as Brian, Laura (4), and John (2) came running to see. “Lee me see! Let me see! Don’t push!” they whined at each other, both jealous and excited. Erin carried her prize delicately across the back lawn to the kitchen and held it out for her mother to see. Angie’s jaw dropped in open-mouthed surprise at the soft, pastel green of the egg. Erin placed the egg on a saucer on the counter, where it waited until I came home from work. Every day after that, Erin was the first one to the chicken coop, and found more eggs. I encouraged her to let the others have a chance, especially little Laura, who desperately wanted to find an egg. Erin wanted to share the fun, but it was hard for her to put aside her eager excitement and watch while someone else found the treasure she knew was there. To her, reaching under the soft, warm hen to find the smooth egg was like finding buried gold. But we had several hens, which soon all started laying, and so there was plenty of gold to go around. The next year I decided I wanted to try pheasants, ducks, and different kinds of chickens. Along with the specialty breed chicks, I had brought home a dozen White Leghorn chicks that the hatchery had put in the box to keep the others warm. The store owner had given them to me free when I picked up my chick order. As the Leghorns grew bigger, so did the red combs on the tops of their heads. They all turned out to be roosters. When I came home from work a few days later, Angie informed me that Teancum (or “Tank”), our huge yellow Labrador, had escaped from his dog run and killed several of the young white roosters. Without a word, I dropped my briefcase, took off my jacket and tie, and headed for the dog and dead chickens. I picked up the dead chickens by their feet, grabbed “Tank” by his collar, and (to the horror of the children) began beating the dog with the dead chickens. Tank yelped and whined as I struck him repeatedly across the face with the carcasses. After about ten lashes, one of the chickens ripped open and made a mess on Teancum’s face. The sight and sound and feel of the tearing chicken turned my stomach; I stopped the beating and locked the dog in his run. The children hid quietly behind their mother as I stormed into the house muttering, “Damned stupid dog” and stomped up the stairs to clean up. At the dinner table, my nerves had settled enough to see that I had upset the children’s nerves. Feelings of guilt began to replace feelings of frustration. My friend Don slaughtered his own chickens every year to stock his freezer. With an abundance of non-egg-laying roosters, I called him and asked if I could help him slaughter his chickens, with the idea of learning how to slaughter my own. When I returned home an hour later, the children found me looking a little pale and a little tired. The children didn’t exactly rejoice at the thought. The chickens I was going to kill had become their friends. My logic meant nothing. The children liked the white roosters. I stuck to my guns and told them I had to do “the job” before the roosters got too old and tough. They were already starting to crow, which meant they were full-grown. “How will you do it,” Erin asked sadly. Angie took the children to the Tooele public library the next Saturday, and I stayed home to slaughter the roosters. When they came home I had a bucket full of ice and chicken meat, and a black garbage bag full of feathers and guts. The cats slinked around greedily, smelling the blood and meat. My hands and arms were a bloody mess, and it was obvious to everyone that I wasn’t happy. I had only slaughtered a few of the roosters because of how hard the job had been. I learned later that Don’s hens were bread specifically for skinning in this manner, whereas my roosters were not. My roosters weren’t bread for anything. It had been very difficult to cut through the feathers and thick skin, to find the jugulars, and to pull the skin off of the meat. We baked the chicken for Sunday dinner the next day. The children picked at their drumsticks, knowing that the day before the legs had been attached to living chickens running around our garden catching bugs and crowing. They just couldn’t eat their chicken. Neither could I, I confess. We ate a little, then gave our Sunday meal to the cats. With an incessant guttural groan, the pump pushes water through the neighbor’s sprinkler pipes. Water squirts rhythmically from the sprinkler heads and sprays wildly through leaks in the pipe joints. Still, I can hear the crickets singing to each other in the grass. In the day’s last light, after an evening rain shower, Barn Swallows flit and swoop in the cool air. Inside the coop, a mother Swallow broods over her chicks in her mud-and-horse-hair nest pasted to the side of a chicken coop roof truss. A black-eyed mouse nibbles at crumbs of helpfully ground grain, sweetened with molasses, ignoring the poisoned bait hidden behind wire in a corner of the coop. The heat lamp sends a warm, yellow glow seeping out through the cracks in the scrap-lumber walls, beaming weakly from the windows cut in each pen, where the glass has been broken out by errant children playing soldier fort in the coop rafters, covered now by wire against the raccoons, the skunks, and the Red Fox that hides in the culvert down the street. I watch a kit fox standing high on its haunches to see over the ripening oats. Mother fox, a soft, rusty red, hops high through the ripe oats as if on springs, her bushy tail, as long and thick as her sleek body, rising high with each descent of her head and torso. They are such wild, beautiful creatures, even if they do kill my hens. It was my fault for leaving the hens out at night. The foxes do not kill for sport, but for survival, leaving only the clawed chicken feet and a few feathers in the place of consumption. I don’t worry for the farmers’ new lambs: the llamas stand guard. This entry was posted in Country Living, Farm Animals, Fatherhood, Memoir, Nature, Parenthood and tagged Barn Swallows, Chicken Coop, Chicken Eggs, Chickens, Chicks, Childhood, Farm Animals, Foxes, Hens, Red Fox on December 24, 2014 by Roger Baker-Utah. Roger, Howdy from Harv and Mary. We just read this wonderful post, lying in bed, avoiding getting up and at ’em. haha This was so interesting and as we read, we felt like we were right there through each episode; giggling at some of your words and nodding in agreement and resonating to some others. We so enjoy reading your meanderings about your country life and Harv especially enjoys going back down memory lane. Thank you for sharing these beautiful, tender recollections of days gone by. That’s interesting, Roger. I have made some of my greatest strides in the midst of my busiest times. Now, I am an empty nester and have time for those things that meant so much to me in the past that I had to squeeze time in to do and, I don’t do them. It’s very strange, the things that propel us into action. Very odd indeed! Just adding a note: We were given some beautiful Plymouth Barred Rock chicks, assuring us there were some hens in the batch but, of course, they all turned out to all be roosters so we had quite a dilemma on our hands, same as your experience. Harv was able to give three of them away, he ate one and we still have one in a cage waiting to find a home for him. We kept one and he is a good protector of his harem. 🙂 Just wanted to share the similarities of “life on the farm”.